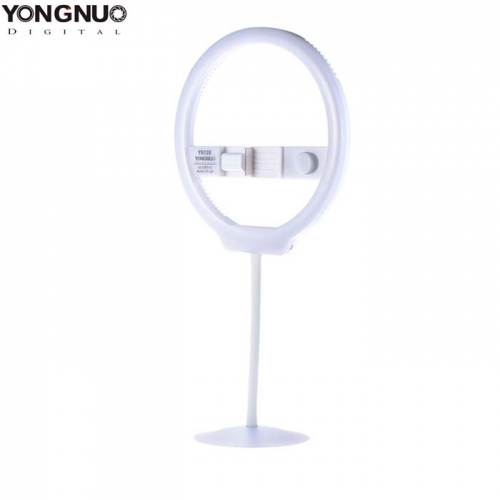 YONGNUO YN128 is a new portable beautify LED light specially designed for live video and selfie. It adopts annular appearance design. For positive fill-in light is softer and much uniform, a perfect shot of catch-lights can be achieved. 128pcs 110° wide angle SMD LED beads give out 7.6W high output power and consume low energy. The white filter and CRI≥95 ensure sufficient, balanced natural light for shadow-free aperture effect. Specially designed for live video and selfie, YN128 LED light source is soft and smooth. 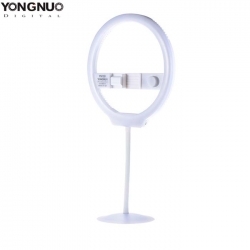 With YN128, your skin is natural white, your facial contour is stereo, and, the video quality and photo quality are exquisite and perfect. Simply by spinning the key in the front, you can adjust light brightness from 0-100% and color temperature from 3200-5500K. Dark or bright, yellow or white, depend on you. Adopting YONGNUO proprietary LED driving technology, YN128's power output is stabler; corrugation and stroboscopic flash can be effectively avoided. and therefore the shooting effect is more reliable. Diameter 27.5cm, YN128 adopts this angular panel to take charming catch-lights. In the middle there is a portable photo clamp. It is good-looking, lightweight and portable. The flat stand is sturdy and its pole is angle adjustable. You can also mount it on camera. 3 power supply methods - phone charger, portable power pack and computer USB port. Item Size: 27.5 * 26.7 * 1.8cm / 10.8 * 10.5 * 0.7"
Package Size: 29.3 * 28 * 5.2cm / 29.3 * 11 * 2"